EDITOR'S PREFACE . . . . . . . . . . . . . . . . . . . . . . . . . . . . . . . . 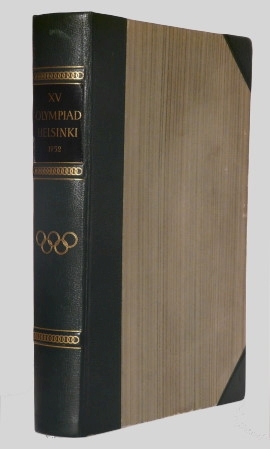 THE TASK COMPLETED . . . . . . . . . . . . . . . . . . . . . . . . . . . . . .
INTERNATIONAL SPORTING FEDERATIONS . . . . . . . . . . . . . .
XV OLYMPIA HELSINKI 1952, ORGANISING COMMITTEE . .
PREPARATIONS FOR THE 1940 OLYMPIC GAMES . SPORTS DIVISION . . . . . . . . . . . . . . . . . . . . .
Events and Demonstrations . . . . . . . . . . . . . . . . . . . . . .
Scorecards and Forms . . . . . . . . . . . . . . . . . . . . . .
Arenas . . . . . . . . . . . . . . . . . . . . . . . . . . . . . . . . . . Judges and Sports Officials . . . . . . . . . . . . . . . . . . .
Order in the Arenas . . . . . . . . . . . . . . . . . . . . . . . .
Equipment . . . . . . . . . . . . . . . . . . . . . . . . . . . . . . . .
Preparations for the Torch Relay . . . . . . . .. . . . . .. .
GENERAL PURPOSES DIVISION . . . . . . . . . . . . . .. . . . . . . .
Medical Service . . . . . . . . . . . . . . . . . . . . . . . . . .
CROSS AND MEDAL OF MERIT . . . . . . . . . . . . . . . . . . . . . .
FINANCIAL ASPECT OF THE XV OLYMPIC GAMES . .. . . THE OLYMPIC PROGRAMME AND ITS EXECUTION . . . . Athletics . . . . . . . . . . . . . . . . . . . . . . . . . . . . . . .
Boxing . . . . . . . . . . . . . . . . . . . . . . . . . . . . . . . . Gymnastics . . . . . . . . . . . . . . . . . . . . . . . . . . . . . .
Modern Pentathlon . . . . . . . . . . . . . . . . . . . . .
Equestrian . . . . . . . . . . . . . . . . . . . . . . . . . . . . . . . . .
Canoeing . . . . . . . . . . . . . . . . . . . . . . . . . . . . . . .
Yachting . . . . . . . . . . . . . . . . . . . . . . . . . . . . . . . . DEMONSTRATIONS . . . . . . . . . . . . . . . . . . . . . . . . . . . . . . LIST OF ADVISORY EXPERT COMMITTEES . . . . . . .. . . . . . . . .